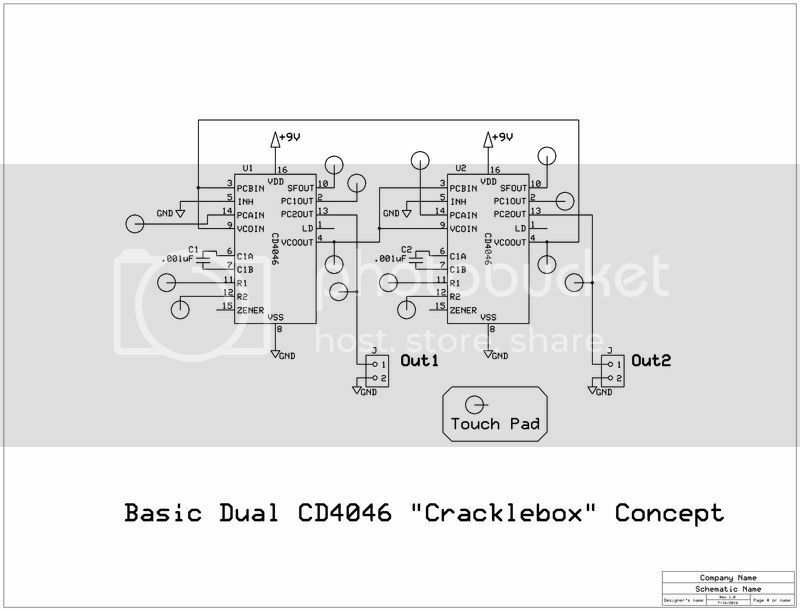 My tribute to the Cracklebox by Michel Waisvisz and Geert Hamelberg. (1) It abuses cheap and readily available ICs via the simplest and perhaps stupidest means possible: directly poking IC pins. (2) The LM709 has external frequency compensation pins and the CD4046 has its own sort of bandwidth limiting via resistors (or fingers in this case) at pins 11 and 12. (3) Like the original Cracklebox, this circuit is pretty much silent unless prodded. (4) It makes squeals and fart noises that are unique to each player. There are only FOUR (4) components needed for the barebones version and it costs about one US dollar to make. 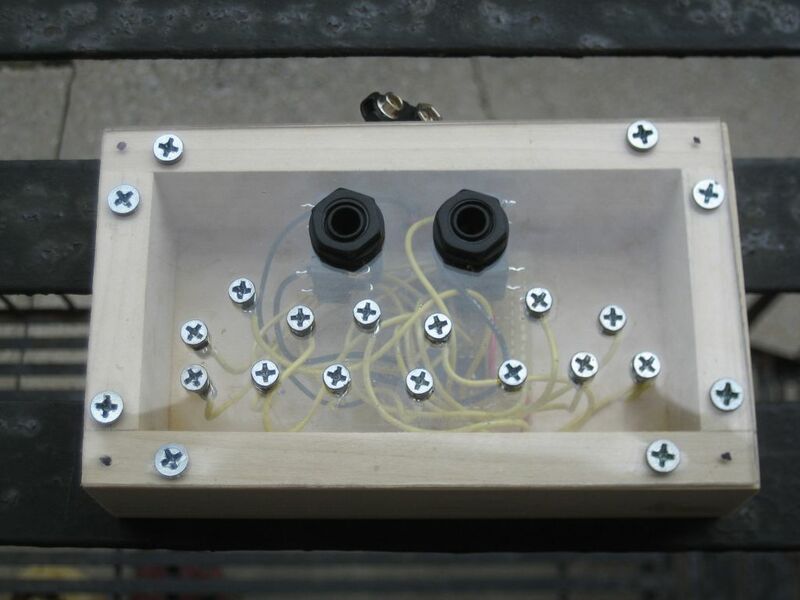 With some additional circuitry, it can be the heart of a chaotic gesture-controlled synthesizer system. I hope that you enjoy it. That's awesome. Seems easy to put into a Euro panel too. I love simple circuits like these! Is there a reason this couldn´t be a single, feeding back to itself? Maybe with a little filter? The additional $.50 in parts buys you stereo operation and opportunities for cross-modulation. (1) It abuses cheap and readily available ICs via the simplest and perhaps stupidest means possible: directly poking IC pins. Is this going to be a static-discharge problem? I've never had problems with modern CMOS and static discharge and I've working with similar circuits for a few years. YMMV of course. I'd use sockets for those IC's. There's a good chance that repeatedly touching unprotected floating pins/connections on a Cmos device will damage the device. yes, thanks! Lunetta stuff is cool! There's a good chance that repeatedly touching unprotected floating pins/connections on a Cmos device will damage the device. The only "floating" input in this circuit is the Signal Input (pin 14)... but it's not a digital logic gate! There's a linear amplifier inside that tries to amplify whatever you plug into it up to logic levels to drive the phase comparators. Generally, most people would want to amplify signals externally instead of using this feature of the CD4046. Don Lancaster writes about this in the CMOS Cookbook: "Linear operation causes extra amplitude-variation sensitivity, jitter, tearing and generally poor noise immunity." I believe that this irregularity is the source of much of the interesting behavior in this circuit. Anyway, you don't need a pull-down or pull-up resistor there. CMOS does not like static and can blow up really easy when zapped. I'd put a low value resistor (50-100 ohms) in series with the touch pads along with protection diodes to the power rails used by the chips. If, as Repeater says, these chips are able to withstand static anyway, then it doesn't matter. But if static were a serious issue, then a series resistor that size would be no protection at all. Static charges are in the range of a few thousand volts. A 100 Ohm resistor would pass a few tens of amperes for as long as the charge lasted, and that's far more than the chip can withstand. In order to be useful for static protection, a series resistor would have to be in the hundreds of kOhm, bringing the maximum current down to what the chip's internal diodes can support. Maybe a little less if you're adding diodes of your own, and you trust them to switch faster and have less voltage drop than the chip's own. The resistor is not the protection part, the diodes are. The resistor just current limits what goes to the diodes. Just because they say the chip is 'protected' that doesn't mean that it's a good idea to not protect the inputs. In some cases the chip degrades slightly each time it gets zapped but still works until it gets zapped that 100th (or whatever) time. Also from the On Semi datasheet there is the however clause. VSS ≤ (Vin or Vout) ≤ VDD. If, as Repeater says, these chips are able to withstand static anyway, then it doesn't matter. But if static were a serious issue, then a series resistor that size would be no protection at all. A 100 Ohm resistor would pass a few tens of amperes for as long as the charge lasted, and that's far more than the chip can withstand. Indeed, but that's the point - because the voltages are so high, a resistor that size does not meaningfully limit the current. It would have to have a very much larger resistance before it would make any difference compared to just the diodes alone. I count 10 unconnected/floating pins... they don't have to be "inputs" to be susceptible to an ESD event. thanks for sharing, this looks neat. might have to build one or two! Let's get empirical. I wonder how many people who are certain that this circuit will fail have actually built one and confirmed their suspicions. So far, there have been four successful builds and no CD4046s harmed. My original unit has been working for 2 months with almost daily usage. I'll update this post and keep a tally as long as people respond. If you have the time to take 5 minutes to post, you have time to breadboard a circuit with 4 components, right? Perhaps we'll all learn something. If not, this is a $1 circuit. Thanks for playing! The schematic in the first post has two outputs. Pan them left and right or use a pair of amps and you're good to go. Don't put words in my mouth. I asked a question. Nobody here is "certain this will fail." Riding a motorcycle without a helmet is something many people have done without problems, too. That doesn't make it a good idea. And encouraging newbies in particular to do it is likely to draw some concern from experienced motorcyclists who are still alive. You posted a design that does not conform to industry-standard ESD practices. You say it hasn't failed for you, yet. I'm sure that is true. But it doesn't mean you're exempt from reasonable questions about its reliability. At least you're not selling them. I say kill the chips and let them burn as long as you record the audio everything will be fine. i propose naming this circuit "doomed to fail" - consider what a catchy name did for th atari punk console. and ultimately, arent we all dtf? nobody lives forever.